A new class of home-network device has been appearing over the last year or so in the form of the “distributed Wi-Fi system”, sometimes known as the “mesh Wi-Fi system”. These systems consist of two or three modules, one working as your home network’s router and the other modules working as access points. But they have features that are different to setups where you use an ordinary access point and wired-network backbone or a range extender to extend your Wi-Fi wireless network’s coverage. Some ISPs are even offering distributed-Wi-Fi systems as a product differentiator for their premium packages or as an add-on that customers can buy. They are offering these devices in response to their customer base complaining to their support desks and “bricks-and-mortar” storefronts regarding poor Wi-Fi coverage. When you set up these devices, you don’t have to determine the operating frequency for each of the modules nor do you have to deal with multiple devices for your network to run properly. Typically the only hands-on requirement is to work with one management interface when adjusting your network’s settings. 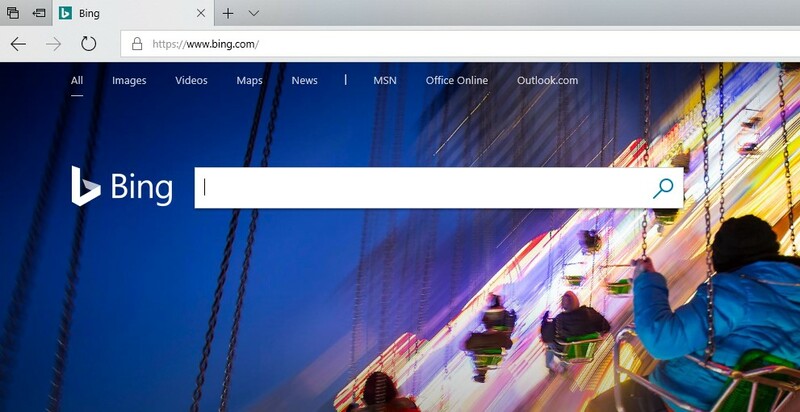 You may even find that this interface is where you set up things like your Internet connection parameters or your network’s ESSID and enable / disable any particular features the system has. You may find that the procedure involved with enrolling additional node devices to an existing distributed-Wi-Fi system may be as simple as pairing a network client device to a Wi-Fi network using WPS push-button pairing. This would simply be about pressing a button on the new device then pressing a button on one of the existing devices or the main node. These systems continually re-adjust the operating frequency and other parameters so as to cope with changes in operating circumstances. For example, if one or more of your neighbours set up new home networks or add access points and range extenders to these networks, you may find that your network underperforms due to the neighbouring networks operating on the same frequency. Even someone running a “Mi-Fi” mobile router or using their smartphone’s “Internet-share” mode could affect the network’s performance. But the typical distributed-Wi-Fi system will automatically tune itself to different frequencies when these situations do occur. As well, it may implement other tactics to provide the best signal strength for your client devices. A problem that users will have especially with wireless range extenders is that your network is split up in to multiple extended service sets or Wi-Fi networks. This can cause problems with users having to switch between different network names to gain the best coverage, something that can daunt a lot of users. If you set up a traditional access-point setup with a wired (HomePlug or Ethernet) backbone, you have to “copy” the SSID and security parameters to each access point’s setup interface. A few HomePlug access points simplify this task using a WPS-based “Wi-Fi Clone” function where you activate this function then press the WPS button on your router to “copy over” the network parameters to the access point. But these systems allow you to create your network’s SSID and security parameters with these being reflected across all of the modules that are part of the system. This includes implementing these parameters across all wavebands that these distributed Wi-Fi systems support. This leads to a network that has the same kind of “roam-ability” as what would be expected for larger Wi-Fi networks with multiple access points. 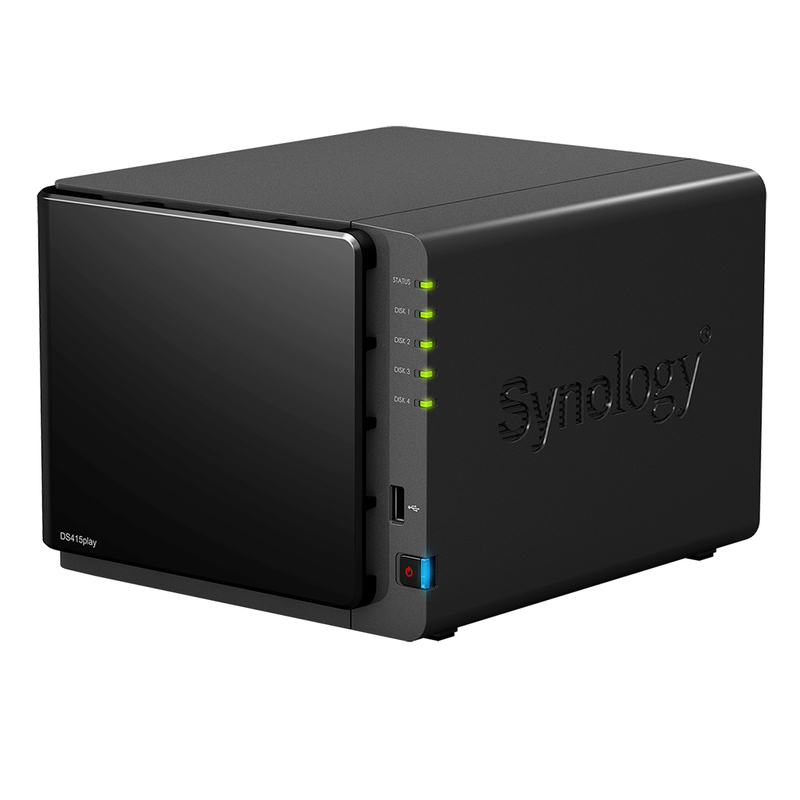 It is similar to what you would have expected with a properly-set-up traditional access-point network. There are two different approaches being implemented with distributed Wi-Fi systems. These affect how the wireless backhaul signal is provided between each of the system’s modules. The mesh method, implemented by Linksys Velop, Google WiFi, and eero require the use of three or more modules with one of these serving as the “edge” router for the network. Here, the wireless backhaul works on a mesh approach where each module effectively receives signals from and transmits signals to the other modules that are in range. There is some fault-tolerance in these setups where the receiving module (node) can rely on other transmitting nodes if one of them fails. On the other hand, the receiving node aggregates the bandwidth it receives from two or more nodes of the network for higher throughput. The other approach, followed by the DLink Covr and the Netgear Orbi works in a similar vein to a traditional router and range-extender setup or traditional multiple-access-point setup. 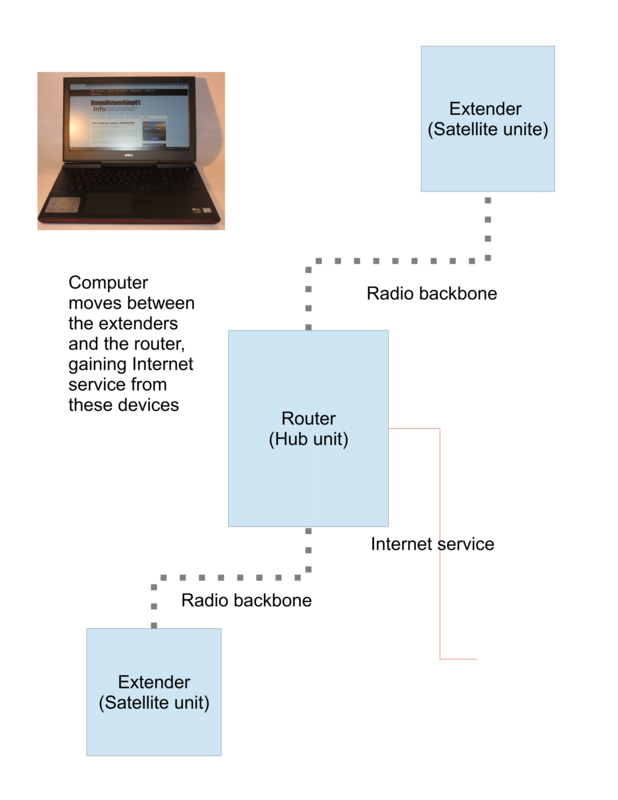 Here, the satellite nodes in this system provide a single backhaul link to the hub node which typically is the router. 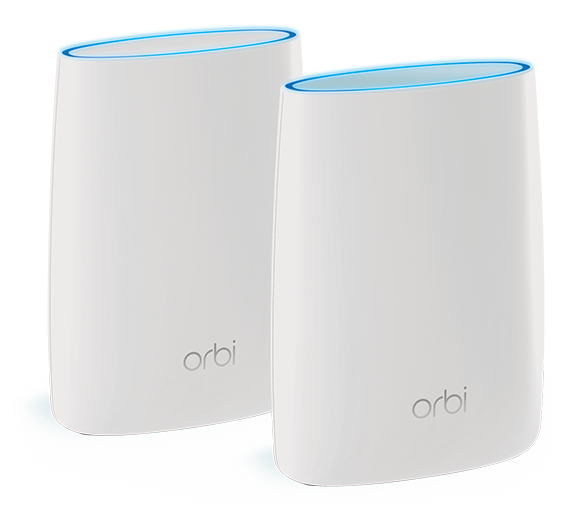 The better designed systems like the NETGEAR Orbi use a dedicated wireless link for their wireless backhaul. This avoids competition for bandwidth by the portable client devices and the satellite nodes wanting to repeat the signal. Most of the distributed wireless setups are connected to the Internet in the same vein as a router where they create their own logical network. This setup appeals to users who have a modem that provides a media-level connection to their Internet service like a cable modem, optical-network terminator or a wireless-broadband modem. This will be a limitation for users who have a modem router like most xDSL connections or users that implement a router that offers very advanced functionality like a VPN endpoint or VoIP gateway. If you have one of these setups and want to use a distributed wireless system, look for one that offers access-point functionality or network-level bridging functionality. Here, these systems just connect to an Ethernet LAN socket on the existing router but you would have to disable the Wi-Fi functionality on the router if you use one of these systems if the node is closely located to the router. Better-designed systems will implement a separate wireless backbone that isn’t used by any of the client devices. These systems will use specific radio front-ends and create a separate wireless network specifically for this backbone while each node has other radio front-ends that simply serve as the Wi-Fi access point for that area. The benefit that is provided here is that the backhaul isn’t being shared with client devices that in the node’s good-reception area. That allows for optimum bandwidth for your distributed-Wi-Fi setup. A handful of these systems are offering a wired backbone as an alternative setup for the network that they establish. This is provided through either an Ethernet LAN connection on the nodes or a setup may implement HomePlug AV500 or AV2 powerline networking as the wired backbone. This feature may be of value for environments where the wireless backhaul just won’t perform as expected such as houses with interior walls made of highly-dense materials. Or these setups can come in to their own with multi-building home networks, where a wired link like HomePlug AV2 powerline networking for existing setups or Ethernet for new setups could link the buildings. On the other hand, if you wired your home for Ethernet, a distributed wireless system that implements support for an Ethernet wired backbone can exploit this infrastructure by allowing you to push out the network coverage further. These systems should be able to treat the wired backbone as though it is another wireless backbone or part of the mesh. With some of these systems, you could push out a wireless backbone that refers to one of the nodes connected to the wired backbone as its “master” node rather than the main router. There are some distributed-wireless systems that are dependent on an Internet connection for them to operate and for you to manage them. Most likely this is evident if the user interface is through a mobile-platform app that links to an Internet resource; along with heavy talk of “cloud operation” in the product documentation. This kind of setup is one that some new Silicon-Valley outfits are heading down the road towards as they want us to join the Internet-dependent “cloud bus”. On the other hand, a system that isn’t dependent on an Internet connection for you to manage the network will allow you to visit a Web-page dashboard through a local network address or resource name and fully manage your network via that dashboard created by the router or node. Some of these systems that have UPnP IGD or management functionality enabled may make themselves discoverable using a Windows computer on the same network if you open Windows Explorer / File Explorer and see it listed as a Network device. This is the traditional practice for most home and small-business network hardware and such a setup may offer the ability to be managed within your network using a mobile-platform app that points to the local resource. But this setup allows you to manage or troubleshoot your network even if the Internet connection is down. You also benefit from the ability to get your network ready before your Internet service is provisioned or deal with service-provisioning scenarios like changing your service provider or connection technology, or dealing with Internet services that authenticate with usernames and passwords. Not every distributed-Wi-Fi setup suits every house. This is because different houses come in differing sizes and compositions. 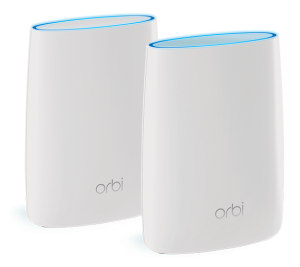 I would pay attention to those distributed-wireless systems like the NETGEAR Orbi that offer a choice of different nodes that have differing signal strengths at different price points. The benefit with these systems is that you can effectively shape your Wi-Fi network’s coverage to your premises size and shape. For example, an entry-level package with a low-output satellite node could earn its keep with providing coverage to an area at the edge of your small house or apartment where you sometimes have good reception but could do with “pushing out” the coverage a bit further for better response from smartphones and mobile-platform tablets used in that area. But you would find that a standard distributed-wireless package may be overkill for this situation. Here, it is similar to creating a HomePlug powerline segment to serve a baseline HomePlug wireless access point to fill in that dark spot and achieve that same goal. But for most homes, you could get by with running a standard distributed-Wi-Fi system that just has two nodes. Here, you install one where your Internet connection would customarily be while the other one either is at the centre of the house or towards the opposite side. A two-storey or split-level building may simply require one of the nodes to be placed upstairs while the other one is downstairs. You may find that houses with a large floor plan may require three or more nodes and/or a mesh-based system for optimum coverage. Systems that support an Ethernet or HomePlug AV wired backhaul in addition to the wireless backhaul earn their keep with those houses that use dense building materials for one or more of their interior walls. If a system only supports an Ethernet wired backhaul, you can team it with a pair of “homeplugs” to gain the benefit of the powerline-network technology which may answer your need with that old house that has a thick brick or sandstone interior wall. As for system management, I would prefer to use a distributed-Wi-Fi system that implements Internet-independent setup and management. This means that if the Internet connection should go down and you had to re-configure your system or you move or change service providers, you can do so. Personally- I would like to see these systems be able to support the ability for one to determine the SSID and security parameters for the wireless network that they are creating. This is important for those of us who are using one of these systems to improve our existing network, whether to supplant our existing router or its Wi-Fi functionality. In this situation, you may want to convey your existing network’s parameters to the new network so you don’t have to go around to each client device that uses Wi-Fi to set it up for the network. It is although the procedure is simplified with most of these systems implementing WPS-based “push-to-connect” client-device setup on each module. Use an access point and a wired backbone or one of these kits? The distributed-Wi-Fi systems do appeal to people who don’t go for a “hands-on” approach in optimising their home network’s Wi-Fi performance. They are also useful for those of us who live in a high-turnover neighbourhood where people are moving in and out frequently. You will also have to be sure that you are not dealing with radio obstacles like interior walls made out of dense materials like that double-brick home that has am extension. On the other hand, a traditional access point linked to an Ethernet or HomePlug wired backbone can work well for those of us who don’t mind a hands-on approach to set up the system and don’t face a situation where they have to readjust their home network regularly. It is also important if we want to use a mix of equipment from different vendors or place high importance on a wired backhaul for reliability. To the same extent, the traditional access point with the wired backhaul is infact the surefire path for dealing with a multiple-building situation such as reaching the granny flat or man-cave garage. 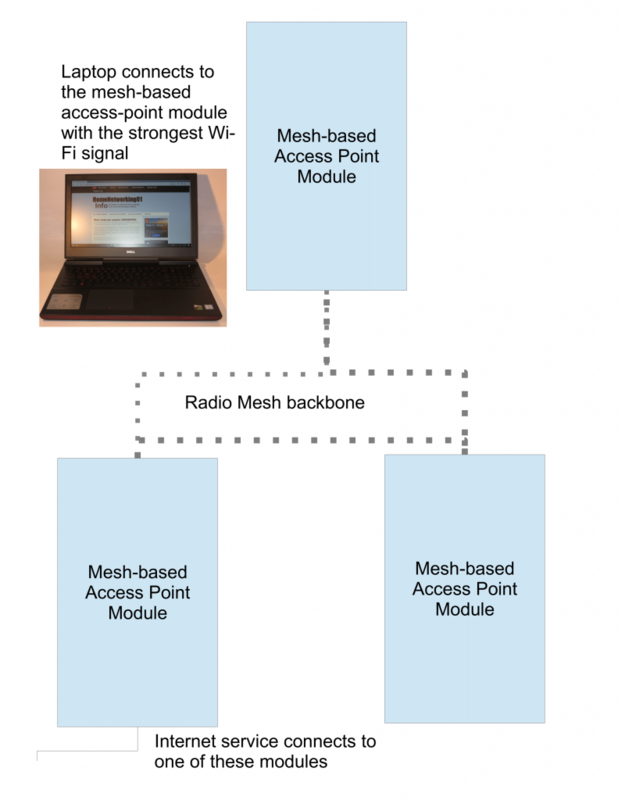 At the moment, the distributed-Wi-Fi system, especially the mesh-based variant, is a technology still in its infancy. What needs to happen for this technology to become more accepted is that it can work in a purely heterogeneous vendor-independent manner, something that has to be facilitated through the implementation of standards that cover mesh networking and simplified setup / configuration requirements. But the fact that major home-network vendors are coming in on the act rather than it being owned by Silicon-Valley startups means that the product class is becoming increasingly viable as a solution for poor Wi-Fi network coverage.